A crocus flower (Crocus sativas) is a wonderfully, rich lavender flower whose stigmas are commonly known as the expensive spice “saffron”. Three stigmas are found in each bloom. These are picked and sold as saffron. Crocus flowers are grown commercially in Iran, Greece, Italy, southern France, and Spain. Fields of these lavender flowers transform into one of the most expensive spices. These little plants grow from three to six inches tall. In the United States crocuses grow in the plant hardy zones 5 to 9. Saffron may be made into a liquid. In Iran, the saffron pistals , also know as filaments, are ground to a fine powder and then mixed with warm water before adding them to their dishes. If you mix the ground saffron with boiling water, the water will infuse to a deep orange color. If mixed with boiling water, this liquid saffron can be kept in a jar for several weeks. Saffron can easily become the enhancer of taste. It can have a very discrete flavor. Mix it with rice and your rice will soon have a fine yellow color. Two methods may be used with saffron filaments. An infusion is where liquid, heat, and time activate the crocus filaments. The other method to use saffron filaments is with gentle heat and grinding. In other words powdered filaments. Once filaments are placed in hot water they instantly start to release color and aroma. It only takes a few minutes to see the reaction. An interesting fact about saffron is how you can tell if what you bought at a very dear price, is really what you were told it was. By using the following purity tests, a saffron buyer will not be taken. Saffron filaments will impart a yellow color to water, alcohol, methanol, ether and chloroform, but not to xylene and bezone. 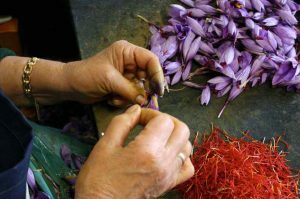 In sulphuric acid, saffron filaments will dye and then turn blue, which changes to red-purple. No oily stain should be left when filaments are pressed between sheets of uncoated paper, indicating the absence of added vegetable or mineral oil. Saffron yields about 5 to 7 percent ash. An excess of ash indicates added inorganic matter, which may be artificially colored. Saffron is an international spice that is used around the world: France, India, Italy, Spain, Sweden, and many other countries. Try it once and you will be enjoying the tantalizing flavor and color with your many dinners.